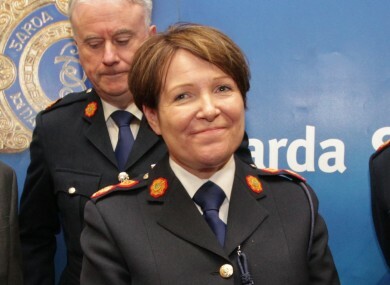 NÓIRÍN O’SULLIVAN HAS been appointed as the new Garda Commissioner on a permanent basis. O’Sullivan was appointed by the government this afternoon after she was the only candidate recommended by a special selection committee set up by the Public Appointments Service (PAS). It follows interviews with a number of Irish and international candidates. O’Sullivan has served as commissioner on an interim basis since her predecessor Martin Callinan retired in March amid controversy over revelations of calls in and out of garda stations being secretly recorded for decades. The government said that the PAS’ “special high-level selection committee” conducted a “global search and two rounds of interviews which involved both Irish and international candidates”. The final round of interviews was held in recent days and involved the chair designate of the new Policing Authority, Josephine Feehily. In a statement issued this afternoon, Justice Minister Frances Fitzgerald said that O’Sullivan’s “experience and proven leadership capacity” leaves her “well-placed” to deliver on the government’s planned reforms of An Garda Síochána in the wake of a string of controversies. Congrats to new Gda Commissioner O'Sullivan. We look fwd to working w/ her to continue to improve oversight & public perception of policing. Ind TD Mick Wallace says appointment of Nóirín O’Sulllivan “almost unbelievable” and shows government has "zero interest in reform”. Earlier this month, a highly-critical report by the Garda Inspectorate identified the absence of up-to-date dispatch technology as well as deficiencies in practices, supervision and governance relating to the recording, classification and investigation of crime. Concerns were also raised about the lack of finger-printing by gardaí and the way in which officers handle allegations of domestic abuse. Fitzgerald said: “The focus must now be to ensure public confidence in policing in Ireland and to support the men and women An Garda Síochána in their day-to-day work of keeping our communities and country safe. “This means delivering on a programme of reform, modernisation and investment with respect to organisation, processes and systems. The aim must be to craft a police service fit to meet the realities of 21st century crime and security. The Minister wished O’Sullivan “all the very best” in her new role. O’Sullivan is a native of Dublin who joined the Garda Síochána in 1981. She was made a sergeant in 1992 before becoming an inspector in 1997. She served as superintendent, chief superintendent before being made assistant commissioner in 2007 and deputy commissioner in March 2011. Email “Nóirín O'Sullivan is the new Garda Commissioner”. Feedback on “Nóirín O'Sullivan is the new Garda Commissioner”.